To demonstrate our diverse web marketing and design capabilities we have provided selections from our portfolio in the following categories below. Below you will find a collection of websites we have designed, re-designed and developed from start to finish. We offer a few options, we develop websites from scratch with all original graphics and code as well as work from templates if the client is more cost conscious. But every site, regardless of its origin, has been hand coded and re-worked by our team. Note: Any site below that refers to being ‘spec’ means it was a ‘paid for design choice’ for that particular client. We always offer our clients draft designs once the initial down payment has been received. Some links below may not work due to either clients changing servers or they are still in production. Please email me if there is a particular site you want to view and I will redirect you to my archives. Description: Free Spirit Media designed the website and incorporated a blog for future social media content. This project involved strategy, design, optimization and implementation. Description: Free Spirit Media redesigned the website and incorporated a fe flash elements. This project involved strategy, design, optimization and implementation. Description: Free Spirit Media redesigned the website and incorporated a few flash elements. This project involved strategy, design, optimization and implementation. Description: Free Spirit Media redesigned the website. This project involved strategy, design, optimization and implementation. Description: Free Spirit Media redesigned the website and incorporated many jquery and backend elements. This project involved strategy, design, optimization and implementation. Description: Free Spirit Media redesigned the website and blog This project involved strategy, design, optimization and implementation. Project: Website design, Marketing CollateralClient: Arbutus West Animal Clinic Ltd. Description: Free Spirit Media redesigned the website and marketing collateral. This project involved strategy, design, optimization and implementation. Description: Free Spirit Media designed the website and marketing collateral. This project involved strategy, design, optimization and implementation. Description: Free Spirit Media designed website and marketing collateral. This project involved strategy, design, optimization and implementation. Description: Free Spirit Media designed the corporate identit, website and incorporated an online blog This project involved strategy, design, optimization and implementation. Description: Free Spirit Media designed an entry gateway template for this site based on link sharing and various other online marketing and advertising strategies. Other on-going project discussions include pay per click campaign managment, media relations, online advertising, blogging tips, e-newsletter program, and affiliate programs. Description: Free Spirit Media designed the website and incorporated an online blog. This project involved strategy, design, optimization and implementation. Description: Free Spirit Media redesigned the website & blog. This project involved strategy, design, writing and implementation. Description: Free Spirit Media designed the website. This project involved strategy, design and implementation. Description: Free Spirit Media redesigned the website. This project involved strategy, design, and implementation. Description: Free Spirit Media designed the website & business cards and identity package. This project involved strategy, design, and implementation. 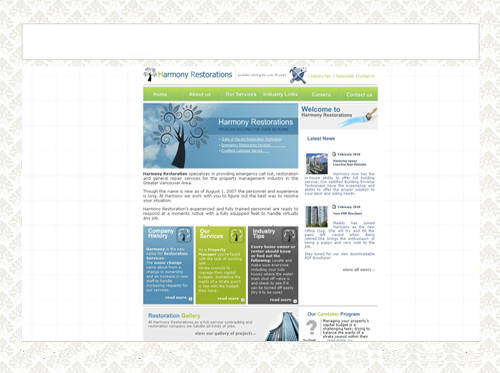 This website was created for a high-end restoration group. Description: Free Spirit Media designed the website. This project involved strategy, design, and implementation. Description: Free Spirit Media designed the website & blog. This project involved strategy, design, implementation and maintenance. Description: Free Spirit Media designed the website & blog. This project involved strategy, graphic & flash design, implementation and maintenance. Description: Free Spirit Media designed the website integrated gallery. This project involved strategy, design, implementation and maintenance. Description: Free Spirit Media provided website, gallery & blog design, strategy and implementation. Description: Free Spirit Media provided website design, strategy and implementation. Add on services included online newsletter design. Description: Free Spirit Media provided website design, for this portal mini site. Description: Free Spirit Media provided website design, for this large MIDI database portal. Description: Free Spirit Media provided website design, strategy, web hosting co-ordination and implementation. Add on services included website optimization and e-news design and delivery. Description: Free Spirit Media provided website design, strategy, web hosting co-ordination and implementation. Description: Free Spirit Media provided website design, strategy and implementation. Description: Free Spirit Media provided website landing page design, strategy and implementation. Description: Free Spirit Media provided website spec design. Description: Free Spirit Media provided website spec design, strategy and implementation. Description: Free Spirit Media provided website design, strategy and implementation. Marketing Collateral, business cards and email marketing.